Cream puffs, those tender and delicious little pastries, are always made with the same method. Water and butter are brought to a boil in a saucepan then flour is stirred in all at once. The dough that forms is stirred and cooked for a few minutes until it leaves the sides of the pan. Then, off the heat, eggs are beaten in, one at a time, until the dough is shiny, glossy, and sticky. The dough is dropped onto cookie sheets and baked in a hot oven. Flour provides the structure for the product. The gluten, or protein, in flour combines to form a stretchy web that traps air bubbles and sets. Starch in flour sets as it heats to add to and support the structure. 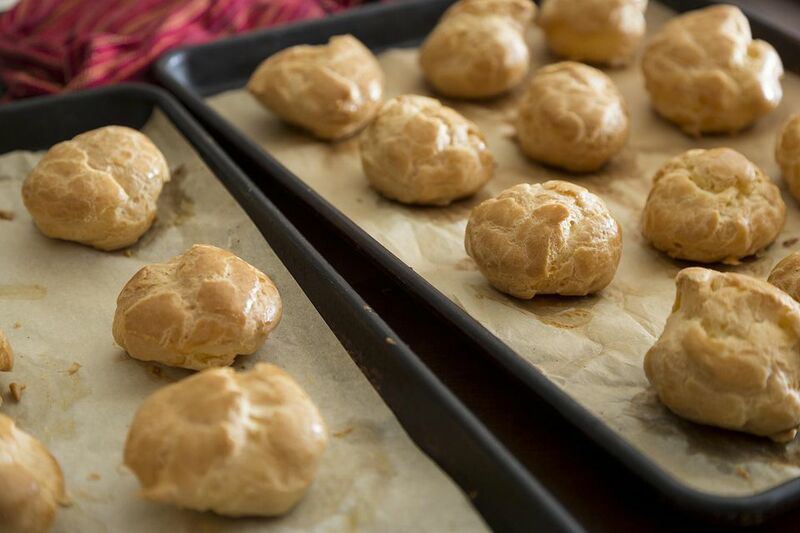 In cream puffs, we want lots of protein, so don't use cake flour, pastry flour, or other low-protein flours, such as self-rising. The flour must be added all at once to the boiling water and butter mixture, so the starch swells and absorbs the liquid and the dough has structure. The more fat, the more tender the cream puff. Too much fat and it will interfere with gluten production, and your cream puffs will collapse. Follow the recipe carefully! The water and butter mixture has to be boiling before adding any more ingredients because the heat is necessary to swell the starch granules in the flour. Make sure to bring the water and butter to a rolling boil -- one that cannot be stirred down. Eggs are a leavening agent and the yolks add fat for a tender and light texture. The yolks also act as an emulsifier for a smooth and even texture in the finished product. Egg proteins add to the structure of the cream puff. You can use a hand mixer to beat in the eggs since the cooked dough doesn't easily accept the egg. Make sure each egg is thoroughly beaten into the dough and disappears before you add the next egg. It may seem like the egg will never be absorbed, but it will happen -- just keep beating! Most cream puff recipes call for whole eggs. You can substitute two egg whites for one of the yolks for a crispier puff, since egg whites don't add fat to the structure. Have you seen recipes for cream puffs that call for heating the oven to a lower temperature, then increasing the heat after the puffs are in? The puffs have to be heated quickly, from the bottom of the oven, in order to form the steam that provides the puff before the structure sets. After the puffs look done, you can cut a tiny slit in the side of each puff to let some of the steam escape. This allows the inside of the puff to dry out, stiffening the structure.